Our 2011 GE (Monogram!) side-by-side has been losing water pressure to the door dispenser for a couple of years, and now slowed to a trickle, as well as small hollowed-out ice cubes. The GE MWF water filter is not the issue because the problem persists even after the filter is removed and the bypass plug installed in its place. This model has more than one electric solenoid valve. It has the typical water inlet solenoid valve, and bolted onto the back of that, a second double solenoid valve, which seems to send water from the filter outlet side down to both or either of the door dispenser or the icemaker in the freezer compartment. From what I am reading, the intake solenoid valve which receives water from the copper in-line saddle valve in the home, and sends it to the water filter head, is the most likely candidate for failure and replacement. Here is a photo of the entire solenoid valve assembly, including both valves. Note that the valve on the right side (with the orange inlet port) is the more common water inlet valve. 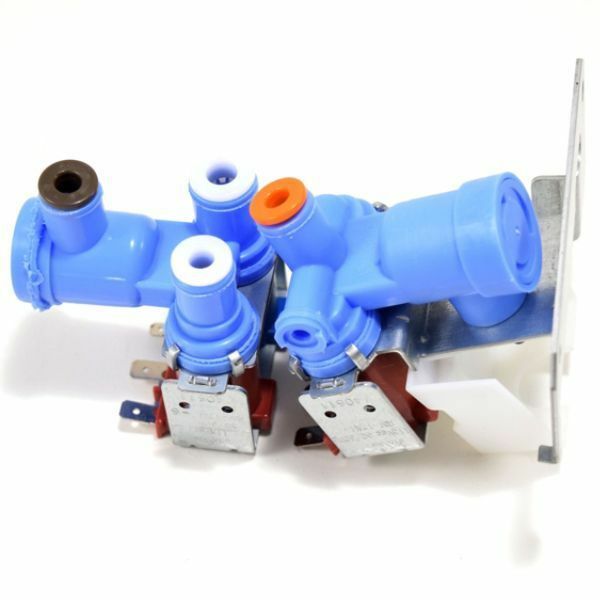 The simpler water inlet solenoid valve (on the right side) is much less expensive than the entire assembly, that includes separate solenoids on the left side that route water down into the appliance for the dispenser and ice maker. I'd hate to buy the solenoid valve on the inlet side and find that the problem was in the larger double solenoid valve. Can an experienced DIY or repair person comment on which valve solenoid to purchase? I have also read that occasionally the filter socket or filter head has some call it, can also go bad, although this seems much less likely to me. Diagnostic tips would be much appreciated! How to remove ice maker from Miele KFN 8701 SE freezer? How do you repair or replace an ice maker in a Samsung RF23HCEDBBC Refrigerator? Does it make sense for a freezer to work , but the refrigerator to not work? How would I tell if a dealer sold me a refurbished appliance as new?